Unorganized Liberals have fewer labels to classify them, and fewer fences to divide them from others of the same community than those who are inside church organizations. The sects generally claim to teach all the virtues; yet one may belong to none of the sects and possess the virtues in an eminent degree and be an active worker in philanthropic reform; for virtue is not limited to sects nor is it based upon creeds. I must confess that I belong to that great mass of people who are, or when I used to go to church in boyhood were characterized by the clergy as “sinners,” “warned to flee from the wrath to come,” never having been “converted” and joined the church, and, moreover, who have had the hardihood to oppose the theological teachings of the church as irrational, its spirit as sectarian and its fellowship as narrow. We are not, in fact, actually unorganized. We live in a social medium, like other people. We belong to the organization of the nation, of the State, of the city or town, not to mention the many smaller associations to which we may belong; but we are unorganized in the sense that we are not members of churches or local religious societies, and,’ many of us, occupied with work in these larger communities to which we belong in common, have not, to tell the truth, been much distressed because our convictions and love of liberty have excluded us from the sectarian organizations in which many find their chief social life. Of late years, while Free Thought has increased in denominational and semi-denominational organizations, it has also made great progress outside these organizations. The number of men and women of intellectual and moral worth who have no stated connection with any church is large and increasing. Public opinion does not require, as it once did, church membership or church attendance. The old creeds are boldly criticized before large audiences and in books which are widely read. The churches are aiming to make the basis of fellowship more ethical and less theological, and are thereby retaining many who would otherwise leave them. Yet outside all ecclesiastical lines are multitudes. some of them having severed church connections, but the majority never having formed such connections. These outsiders constitute an heterogeneous mass, strong if tested by numbers, the common spirit of liberty, rejection of the miraculous and the authority of alleged divine revelations, but weak if judged by organization, or unity of thought or purpose in other respects. Those whose thought has taken them out of or prevented their joining the churches, represent great diversity of views, character and condition. These are the unorganized Liberals. The word “liberal” is applied in the old world to political principles and parties; in this country to unorthodox religious views. It is here used by, or applied to those who have discarded the popular theology and who reject the Bible as a work of supernatural origin and authority. In the large class thus designated are persons of every degree of culture and social standing, of different tastes and of opposite views on every subject outside the realm of demonstrated knowledge. Their agreement in rejecting theological beliefs by no means helps them to unity of thought or concert of action in the sphere of party politics, on questions of finance, on social problems, on political economy, nor on the multitude of questions, speculative and practical, which constantly present themselves for the consideration of the thinker and the philanthropist. Nor are they agreed as to the attitude Liberals should assume toward the prevailing theological system or the proper method of counteracting its influence. Some Liberals are interested chiefly in criticizing and denouncing the absurdities of theology. Some find more congenial enjoyment in popularizing science and diffusing general knowledge. Liberals, representing different degrees of culture and different social conditions, have arrived at the conclusions they hold in common by different methods and under widely different conditions. One class has outgrown theological beliefs in an atmosphere of religious bigotry and under influences that have stimulated the critical and combative tendencies. Persons of this class are usually direct in opposition and harsh in criticism, often impolitic in their methods, and impatient with those whose general agreement with them and dislike of their methods they regard as evidence of timidity and hypocrisy. They are very much inclined to think that genuine Liberalism is limited to their own phase of thought and method of procedure. Another class is composed of persons who have outgrown their old religious beliefs and influences in harmony with their feelings, who have had but little contact with avowed, aggressive unbelievers, who feel no intense hostility to Christianity, but would be glad to see it reconciled with reason and common sense. Many have never had personal experience of the suffering involved in the conscientious rejection of theological beliefs once intensely believed, but are unbelieving from a predisposition to skepticism, from intellectual inability to accept unproved propositions, and from philosophical indifference to questions of a speculative and unverifiable character. Persons of this class are usually the ·most cool, levelheaded and dispassionate Liberals. but the least enthusiastic, the least aggressive and the least interested in sustaining or encouraging organized efforts to destroy or to check superstition. 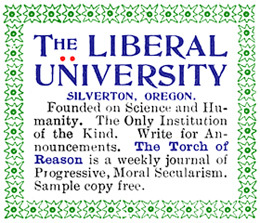 Then, among Liberals are men and women of constructive and destructive tastes and tendencies; those who, although they entirely agree in their general views pertaining to Christianity, have but little community of thought or feeling in their work; those who are devoting themselves to science, literature, art or some reform, with but little interest in a theology they have discarded; and, on the other hand, those whose chief interest is in destructive criticism: who regard exposure of the claims of the theology as to sacred books and superhuman revelations as the most needed and important work of the age. The words “radical” and “conservative” are often used to distinguish two classes of Liberals, but usually with little propriety or justice. Liberals who imagine they are radicals par excellence may be, indeed, superficial and erratic with some crochet in their heads, some theory or scheme by which they fancy, in their simplicity, that the world is suddenly to be disenthralled, regenerated and redeemed. The real radical Liberals are, of course, the men and women who think, who go to the root of things, who acquaint themselves with bottom facts and basic principles, and not those who clamor for great social changes, with no knowledge of economic principles or sociological science; who mistake a rabid spirit for radical thought and vituperation for argument. Many who, although they have outgrown their former belief in dogmatic theology and the infallible authority of the Bible, yet feel an indefinable reverence for the Christian name, and derive satisfaction from the thought that the book in which their fathers and mothers believed through all the tribulation of life and in the solemn hour of death, is inspired, at least in a .general way, and to a greater extent than any other work. The name “Christian” has for them a fascination, and they emphasize the importance of distinguishing between the simple teachings of Jesus and the theology preached in his name. Others reject without qualification the Christian religion, considered as an extra-human or exceptional element introduced into the life of the race, yet recognize it as a system that has been evolved to suit man’s condition in different stages of his development, and in this age should be interpreted in the light of the largest knowledge, with the most liberal construction and in the most catholic spirit. They are willing to permit the name “Christian” to stand for the highest thought and the noblest work of the age, the grandeur and glory of which, they maintain, are due in no inconsiderable degree to the powerful impulse received from the character and teachings of Jesus, which they think have been an important, if not the most important, factor in the progress of man. Others still there are who, rejecting not only the miraculous element of Christianity but supernaturalism in every form, yet concede to Christianity, in common with Buddhism and Mohammedanism, an important and necessary place in the evolution of society and in the growth of civilization and, instead of regarding it with disdain, view is as a religion which, with all its imperfections, has persisted because it has represented man’s best religious thought and aspiration, from which it grew as naturally as the flower grows from the seed, the soil, and the air. To others, Christianity appears as an unmitigated evil, a superstition which, although it had its origin in innocent ignorance and credulity, has been the greatest obstacle to human progress that man had had to encounter. Others still, although they belong to the class that the science of the age is leaving far behind, would have Christianity regarded as an imposture, devised and designed by crafty men to enslave the human mind and to enable them to control it in their interests. Some Liberals have a firm belief in a supreme intelligence and a strong, and, to them, precious hope of a future life; while others are doubtful of the existence of an intelligence that directs the ongoings of Nature, and are skeptical as to the continued conscious identity of man after bodily dissolution; and they emphasize these doubts in opposition to religious faith. There are many who take the position of Spencer, that matter and mind are but phenomenal existences, but manifestations of an ultimate reality that is known only as revealed to us in consciousness, that in itself it is utterly inscrutable; and that, therefore, the worship of an anthropomorphic deity, notwithstanding it has a reason in man’s undeveloped nature, and has been, and with many is yet, a necessity, has in “pure reason,” no foundation whatever; that while the wonder and awe regarding the eternal mystery of being, unsolved and insoluble, must continue, the petitional prayers addressed to this being are, in the light of the unimpassioned understanding, irrational and absurd. There are others who have no patience whatever with such words as the “absolute,” the “unknowable,” the “inscrutable,” and regard their use as a species of temporizing and as an evidence of a disposition to compromise with theology. They declare that Nature is the only existence, and that matter is the all-sufficient cause of phenomena, and moreover that he who refers to an unknowable or to a power behind Nature, has not yet outgrown the swaddling clothes of his intellectual infancy. There are some who have acquainted themselves with profound and erudite works pertaining to Christianity written during the last twenty years, while others have not advanced one step beyond the eighteenth century deists and materialists and are actually offended by a suggestion that the works of those writers do not comprise the best thought and the best religious criticism of this generation. Some Liberals cling to the word religion as pleasant to their ears and dear to their hearts; and with such it represents whatever is grand in thought and endeavor; while others say, with Hobbes, that the only difference between religion and s11perstition is that the former is superstition in fashion, while the latter is religion out of fashion. Some Liberals accept spiritualism, modern spiritualism, as their philosophy (and to some it is a religion even), and not a few are strong in their adherence to certain doctrines. Too many are ready to accept without proof narratives as marvelous as many of those old miracles, belief in which has declined with the advance of science. Others, among Liberals as among church people, are incredulous or indifferent in regard to facts and phenomena to which, after inexcusable delay, the attention of men of science is being directed. Some think that the most effective way to destroy superstition is to assail it with merciless criticism. This is generally the view of those whose conversion to Liberalism is recent or has been sudden. Others think the work of criticism, although important and valuable, should be, in this age, secondary to the presentation of that positive thought which must ultimately replace the teachings of theology and the creeds of the churches. In view of these facts, a theoretical or nominal classification of Liberals, as George Jacob Holyoake once suggested in a discourse delivered in Boston, might be of advantage. He did not, of course, wish to see Liberals separated and organized into cliques, but terms employed that will enable all to understand the positions and principles of the various classes of Liberals. When representatives of matured and scholarly thought find themselves classed with persons of the most opposite views, under the general name of Liberals, and find their names used in connection with the crudest thought and the wildest vagaries, with which they have not the slightest sympathy, it is but natural that they should wish for some more definite name in addition to the general term Liberal. With such diversity of thought and conditions, the unorganized Liberals are not likely to unite soon for any kind of constructive work which does not ignore their differences. The sects are hardly more divided than these different classes of Liberals, except in the spirit of liberty. These Liberals are so individualistic that their formation into a consistent organization, except for some general purpose which all hold in common, is impossible. Many of these Liberals will probably continue, so far as religion is concerned, in an attitude of protest and denial, and so long as the mere authority of books and creeds remains, who shall say that the attitude is not needed, and that those who remain negative and individualistic are not doing an important work? For all original thought must come from individuals. All great moral and social reforms must receive their first impulse from the few and not from the many. Nothing, therefore, can be more imperatively demanded in the interests of progress than the freest and fullest individual expression of those opinions which clash with the orthodoxy and conservatism of the day, as a counterpoise to the tendency of an arbitrary and despotic public opinion to make all think alike, and thus to produce “intellectual place at the price of intellectual death.” It is not simply the right, it is the duty of those in advance of their fellowmen to speak their honest thought, and in a way to be understood. They who temporize in dealing with great questions of public interest are, so far, though they talk and write in praise of morality, the enemies of moral progress. Loyalty to conviction, courageous devotion to the highest conceptions of truth, regardless of public opinion or personal interests, is a demand of the times, both.in public and private life. It is not enough for the liberal thinker of to-day to praise those who gave to the world their best thought. Nearly all the intellectual and moral heroes of the past have their eulogists among representatives of the popular churches of to-day. The thought of the past is no finality. Our intellectual horizon was not fixed forever by any or all the thinkers now dead. Darwin’s views, now largely accepted by men of science, were ridiculed by press and pulpit within the memory of men who are yet young. If there were no conceptions of to-day similarly regarded by those who present public opinion-which does not endorse Darwin’s teachings, but is tolerant of them-the fact would not be creditable to this generation. There is a vast amount of truth not likely to be popularly received for a long time, and they who defend it, in spite of the tyranny of public opinion, perform a service the value of which cannot be estimated. But there are thousands of Liberals who recognize the fact that the old creeds are decaying and that the newer thought is growing as fast as the people can easily adjust themselves to the changes; and seeing the great progress which has already been made, inside as well as outside the churches, many are considering whether in the future the churches or organizations growing out of them and Liberal associations, may not become a great power for moral, social and educational, as well as for Liberal religious work. There are such, I believe, who would like to do for themselves, for their children and the community, in organizations, what cannot be done by them, or cannot be done so effectively, in an unorganized condition. Liberals have in some places formed local organizations, but it has not been possible to sustain them without leaders or persons with directive ability giving their time and attention to them, devising methods for their support and supplying the intellectual needs. Usually such societies have been short-lived, for several reasons which I have not time to indicate, and some of which are too obvious to require mention. The free religious association, founded more than a quarter of a century ago by a few broad minds who were dissatisfied with the limitations of Unitarianism, even, has had the sympathy and support of many of the religious Liberals who belong to no local organization. This association stands for intellectual liberty, moral character and unsectarian fellowship, and for that deeper unity underlying all differences, based on love of truth and desire for higher morality and an improved social welfare. The members are not required to repress any of their individual convictions nor any of their individual views as to the best methods of advancing the truth and the right. On the contrary they are free to speak their honest thought both on the platform of the Association, and elsewhere, and to work in such ways as they choose. But as this Association has only its annual meeting (unless some other special meetings are called) and its annual meetings are always held in Boston, most of those who belong to it, lose many of the social and other advantages of the organization and in spite of their membership, so far as it is concerned, are practically unorganized. The ethical culture movement, by bringing ethics to the forefront and laying emphasis upon practical philanthropy and the moral education of the young; has appealed successfully to many who were outside the churches, because tired of sectarian doctrines and forms, but who appreciate the social benefits of organization and co-operation in moral work. Some of the Liberal churches make character and not creed a condition of fellowship, since they have outgrown the dogmas which are so offensive to Liberals, since they are, instead of wasting time and money in defending and propagating irrational creeds, engaged in and inviting cooperation in diffusing Liberal thought, many Liberals feel a strong inclination to work with them. There is one reform in which Liberals outside of church organizations have shown some interest, and attempts have been made to sustain a national organization for the promotion of this reform, but the diversity of views on other subjects and lack of wise leadership have been among the causes that have paralyzed organized effort in this direction. The reform is a just one, though it may never come to be a bond of union and co-operation between the Liberals in the churches and those who are now outside of all church organizations. While our national government is secular in its form and basis, even though somewhat perverted in its administration by the force of the popular religious sentiment, in many of the States there is a constitutional recognition of orthodox Christianity quite out of harmony with the broad spirit of the Federal Constitution. The Sabbath laws, the laws against blasphemy and other imaginary crimes, the requirement of an official oath before being allowed to testify in the courts, the use of the Bible and religious exercises in public schools in many communities, are some of the remaining links that still connect the State with the Church in this country-some of the vestiges of the union between civil affairs and religious beliefs and observances which prevailed once throughout Christendom. The exemption of hundreds of millions of church property from taxation in this country means that every taxpayer is compelled to support these churches and to sustain their worship; for if the church property, which enjoys the protection of the government, bore its proportion of the burden, the tax would be so much less. lf the money were taken direct from the pocket of the taxpayer, and he were told that it was to be applied to the support of the churches, the injustice would be manifest, and public sentiment would soon deprive the churches of the exemption privilege. It is thus that wrong and robbery are perpetuated in a way that is not seen and cannot be realized by the mass of people. State secularization means the removal of such evils and the putting of the State upon an entirely secular basis, by carrying out the idea and spirit of the national constitution in the administration of public affairs. State secularization and secularism should not be confounded. Secularization is a system of philosophy. State secularization is the separation of the Church and State, the divesting of the civil government of all religious functions, and restricting it to purely civil affairs, so that while it shall protect all in the right to enjoy and teach their religious belief (or anti-religious belief), it shall neither favor nor discriminate against any of these beliefs. 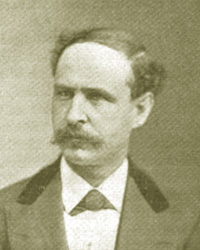 “When a religion is good,” wrote the wise and liberal Franklin, “I conceive that it will support itself, and when it cannot support itself, and God does not care to support it, so that its professors are obliged to call for the help of the civil power, it is a sign, I apprehend, of its being a bad one.” This reform, the secularization of the State, is one on which Liberals in the churches and outside should be able in some way to work together. As Liberals come to understand that systems of religion like constitutions grow, that sudden transitions are neither possible nor desirable, that progress in religion, in common with all development, is possible only by gradual modifications of beliefs and institutions which exist, that evolution is along the line of existing social and religious systems as much as it is along the line of existing species of plants and animals, do they understand those who express dissatisfaction with mere criticism and denial and see the inadequateness of directing their energy in trying to uproot instead of trying to reform and improve old systems of faith. Anyone who refers to those occupied mainly with the work of demolition—however necessary much of the work they are doing—as representatives of the entire strength and value of Liberalism outside of the churches, or who points to the eccentricities and follies incident to transitional stages of thought as indications of the superficiality and weakness of the Liberal movement, shows thereby the limitations of his own intellect. 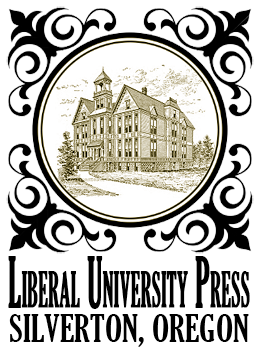 The highest representatives of Liberal thought are men and women like Humboldt, Darwin, Wallace, Huxley, Tyndall; like Spencer, Mill, and Martineau; like Buckle, Grote, Lecky; like George Eliot, Emerson, Fiske, Higginson, and a host of others whose ability and scholarship and whose known Liberal views give them a representative character that none can dispute. The advanced Liberal thinkers of this age are impressed with the importance of positive constructive work in the domain of science, history, art, fiction, and social reform, as well as in that of theological belief; and they are devoting their energies to their respective provinces with splendid results. Their contributions to the world’s knowledge are doing more perhaps to modify creeds and permanently advance rational views pertaining to religion than all other influences combined. Their work is constantly diffusing and strengthening Liberal thought, which is affecting our whole intellectual, moral and social life. Much of this work is being done by those outside all church organizations- by unorganized Liberals. What their relation will be to the church in the future depends chiefly upon the attitude of the church toward them and toward the work which they are doing, individually, and in social and religious reform. Fifty years ago it was much easier to maintain Free Thought organizations in the large cities than it is now. The bigotry, intolerance and persecuting spirit which prevailed served to unite those whose belief made them victims of those religious conditions. Now the very prevalence of Liberal thought, widespread disbelief of the old creeds, and the immunity of Freethinkers from persecution, proscription or social ostracism, make the great mass of heretics indifferent to .organization. They sec that the strength of the Liberal movement is not in the few, weak Liberal societies, most of them in a state of inanition, but in its influence in modifying theological beliefs and in the character of popular preaching; in its making people tolerant and charitable in matters of religion; in modifying the tone of our literature; in liberalizing the press and public opinion; in making proscriptive laws inoperative and in removing legal disabilities imposed on account of religious disbelief; in short, in the transition through which the people of the civilized world have been and are passing with the diffusion of naturalistic, evolutionary thought. This thought has been driving theology from its strongholds and it has so transformed the beliefs, the positions, the spirit and methods of the churches that the advocates of Liberal thought who attack the creeds and claims which were held a quarter of a century ago, is told by the clergy that he is only wasting his force by threshing old straw, that he is criticizing what may be found in the catechisms, hut in which intelligent people no longer believe. The probability is that the existing religious organizations will persist, most of them, at least, for a long time, by adjusting their creeds and methods to the changes in their environment. Already the theological feature is in many of the churches subordinated to the social side of church life; eloquence in the pulpit, first-class music, and whatever is required to bring people together, regardless of interest in religion, are saving numerous church organizations which, without these attractions, would decline and become extinct. Even churches cannot long persist, when they have ceased to be in adjustment to the medium in which they live. The facts which I have given are among the reasons for my conclusion that the organization of Liberals who are outside of the churches, on a large scale, or for any considerable time even on a small scale, is not practicable. By local organizations, under wise management, Liberals may be able to do good work for awhile, but their difference in views, education, wealth, social standing, and the indifference to which I have referred, are pretty sure to make these organizations numerically and financially weak, where, if all the Liberals could be induced to work together, the societies would outnumber the largest churches. Fortunately the diffusion of Liberal thought does not depend upon the societies. It works its way into all organizations, into all minds, and modifies them as fast as the people can accept and assimilate the, to them, new truths which present themselves and ask for that intellectual hospitality which sooner or later they receive.